Falling Leaves and a Sneak Peek Challenge! This week I am focusing all on fall projects using the falling leaves bundle in the Holiday Catalog. Don’t have a holiday catalog? You can see it by clicking on the “Shop Catalog” button at the top of the page or by messaging me. This card is PERFECT for all crafty people. 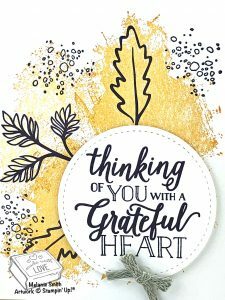 It attracts the avid artistic type of card maker but it is also easy enough for a beginner to make. Let me share with you why. 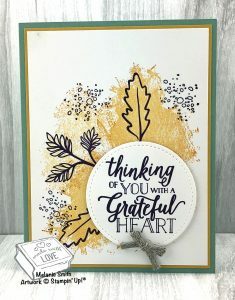 The background was created by adding abstract stamp set called “Artisan Textures” This is the perfect stamp set for a beginner because you are unable to mess up stamping with this set. It is suppose to look abstract. When we team this up with the beautiful Falling For Leaves stamp set the possibilities are endless.